A worker installs the plaques and wording on the award wall. As we brace ourselves for a new semester, we return to a fresh-faced student leadership hallway. Words of encouragement line the brightly designed walls past the athletics recognition wall, near the WolfPack Den. Their prompt for redesign was creating a space that was easy to manage but had more impact than just a plain wall. It was all about furthering the experience the wall brought. The recognition of current students is exceptional and needed, but it also encourages new students to notice how much is out there for them to explore at Madison College. “We wanted it to be dynamic,” Alfano said in regards to the overall design of the space. 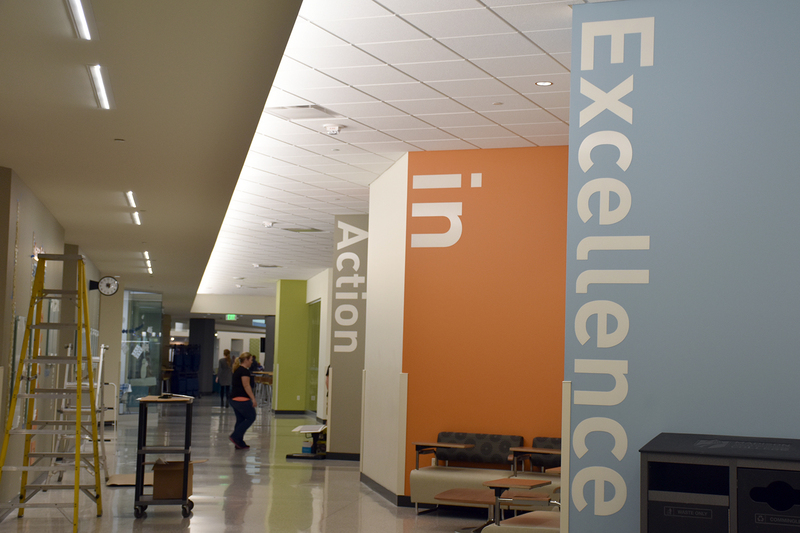 The large words lined on each wall panel make the area inviting and supportive. A collage of words on one of the panels were even contributed by students. The overall message of the area keeps the importance of student involvement in mind. The bold white lettering countering the bright colors is enough to draw anyone in — and this is a place that deserves all the onlookers. With its captivating design, the well-deserved awards are on clear display. While the pathway change is evident, there are a few more accompaniments soon on their way. A large-screen TV will be installed on the back wall of the WolfPack Den that will recognize awards more frequently, as there are an abundance that are prevalent throughout the year. One of these more immediate awards includes scholarships. Pictures of awardees will also be showcased on the screen. The other additional designs to the walls should wrap up some time this week. The awards displayed in the cases are ones awarded at the end of each semester. This is through the process in which each school of the college nominates exemplary learners, tutors, or other student employees. The leadership awards, then, are a result of student club advisors and staff from all sectors of the college. The new student achievement wall now recognizes the efforts and talents students in a contemporary manner. If you get the chance, take a stroll down the new-fashioned hallway and admire all its supporting aspects.